The concept of intellectual freedom is a driving point for the narrative and provides an extraordinary teaching point for readers of any age. The novel does a great job introducing the principles of intellectual freedom to young readership. Dorrie and the other apprentices are tasked with learning the Princples of Lybrarianship. A conversation which was fully explored by the author and supported within the text, its plot and characters. The novel discusses the fundamentals of promoting intellectual freedom and the role of libraries/librarians as the protectors/dessiminators of information–but that we cannot only archive and uphold information conforming to personal ideals. There is a place for differing opinions and the dialogue that goes along with these points of view. Overall, this is a fun book for middle grade readers (grades 5 thru 8). There is a great sense of adventure and mystery plus a good deal of humor which will appeal to many young readers. 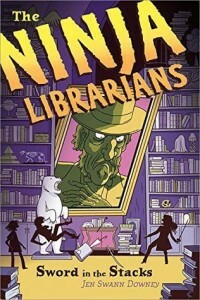 Any history buff or library lover will get a kick out of the premise and the deeper meaning regarding the importance of libraries and intellectual freedom makes this a notable new release.